How are you?! I have been completely gone for a couple of weeks due to personal issues but I’m so happy to be back! hopefully I’ll be able to get the blogging mojo going. I tend to get a little slower during the summer because I have so many activities planned for my son and I during this time so please forgive me if you don’t see many posts!! 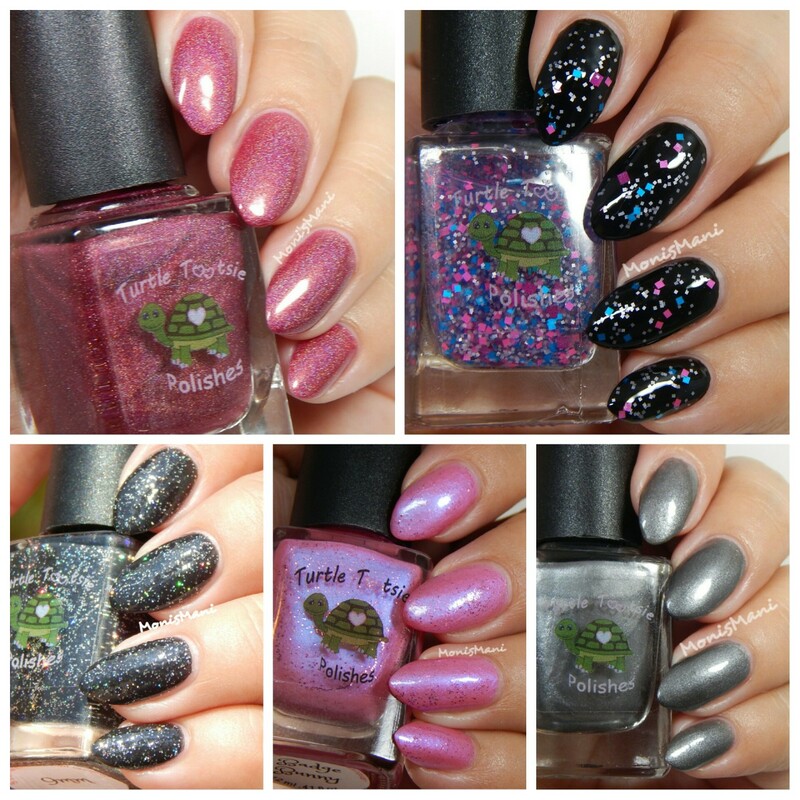 Today I have the great pleasure of introducing you to Turtle Tootsie Polishes first collection!! Chrissy (the mixtress behind the brand) decided to make polish due to the obvious love for nail polish that moves us all and because polish brings her sweet memories of time spent as a child with her grandmother who used to do her nails as a treat. Isn’t that beautiful?? So, after a few months of careful research she decided to go for it and start making her own. This inaugural collection will be available on JULY 1st and is named after Emergency Service jargon (she’s been a 911 dispatcher for over 15yrs) and consists of 10 shades, I have 5 of those to show you today . Let’s get to it! BTW how freaking adorable are those labels?!!!!!! *Badge Bunny – is a bright pink creme filled with pink glitter and iridescent shine. Two coats plus top coat in the pic. *9mm– black creme filled with holographic silver glitter. two coats plus top coat in the pics, I would recommend two coats of top coat for this because even though it was smooth to the touch, it doesn’t look too smooth in the pics. What do I think? overall I really liked the formula on these, they were very flowy and easy to work with , dry time was good and “badge bunny” was on my nails for about 5 days without top coat and it didn’t even chip. It’s hard to believe that this is Turtle Tootsie‘s first collection but it’s so good to see that Chrissy has that down and cannot wait to see what she comes up with next. I also want to thank Chrissy for her understanding, I was in the middle of swatching this collection when I had to rush my mother to the E.R and we ended up staying there for 5 days and Chrissy was very understanding about the whole thing. So once again I am truly happy to be able to work with indies not only for their product (which I love) but also because of their humanity. Good luck Turtle Tootsie ! Wish you the very best! smoke showing & hemorrhage. I love them both! 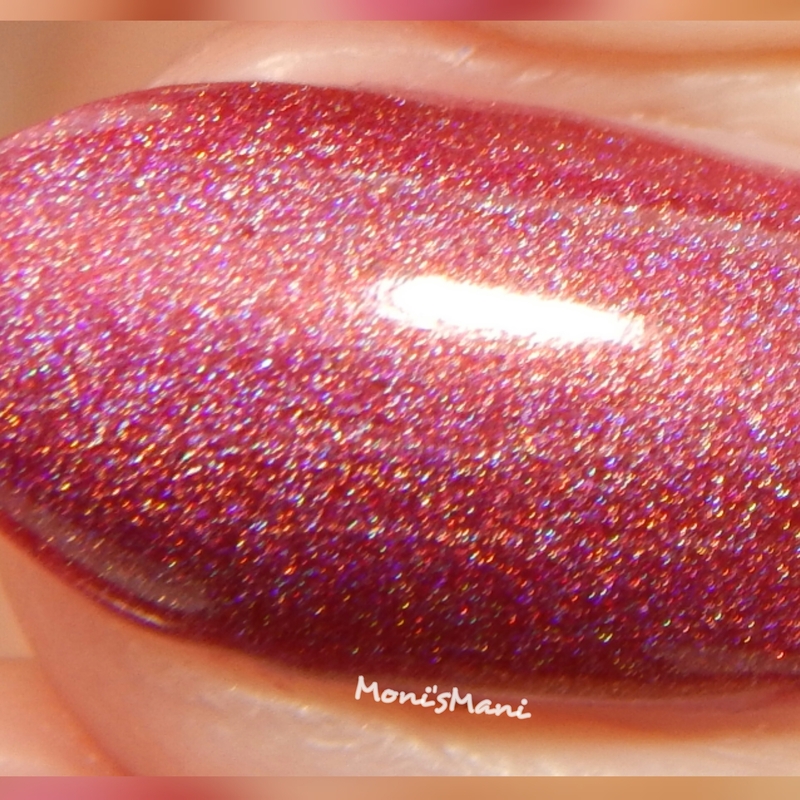 Hemorrhage is so pretty, lovely swatches! Ahhhhhh!!!!! Square glitter!!!! 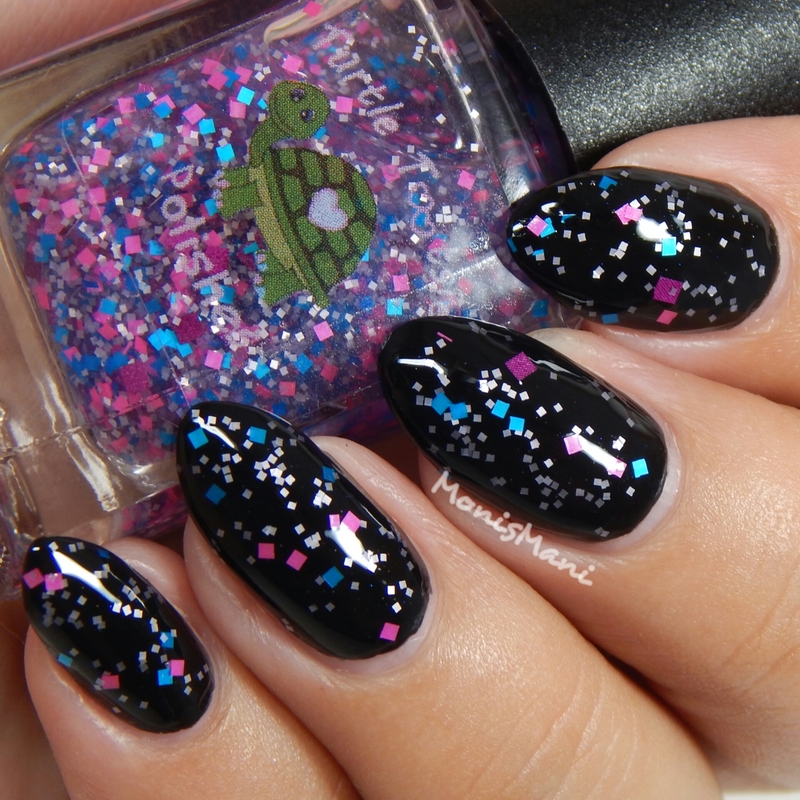 Neeeed ALL the square glitter!! I love “Psych” and I need it! The name badge bunny cracks me up. I had no idea that was a thing until a friend of mine who’s a cop let me in on that one. My favorite is Psych. It looks amazing over black! So many gorgeous colors! What a great collection! Yes! She did a great job! I really like Smoke Showing! 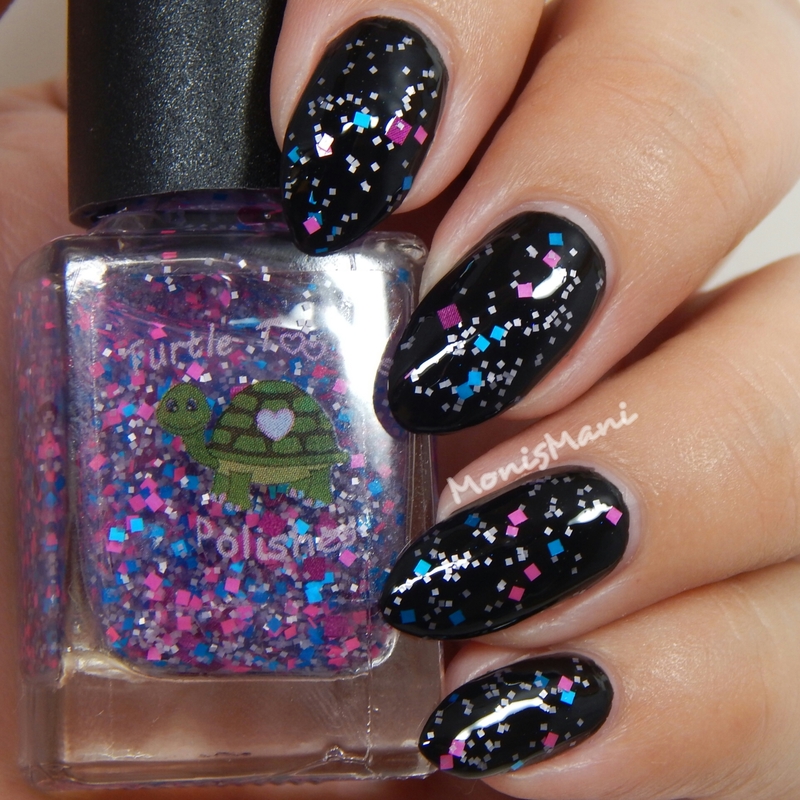 All of the polishes are gorgeous though! The bottles are so cute! My favorite is Hemorrhage. I love the swatch for Psych, especially with the matte topcoat. It’s really a beautiful glitter topper. Thank you! Yes i love it!! Lovely swatches! I really like 9MM! Psych is fun especially with the matte top coat! Yesss! I love mattefying glitter toppers! Great swatches! I really like Psych! Badge Bunny is just absolutely beautiful! Wonderful photos – I totally hear you on the summer time = no swatching time. I’ve been incredibly busy with my kiddos too! Thank you jessica!! Im trying to make the best of it since its my sons last summer before he starts school. Im taking it pretty hard so I just wanna enjoy it as much as possible! Gorgeous beauties! Hemorrhage and 9MM are my favorites! !